A fine, classy, classic blues record from one of the genre's enduring talents. Pianist Marcia Ball has been a fixture in the blues scene for 40 years. Veteran artists sometimes surprise and take interesting detours but by this point in their career, most settle in comfortably to the terrain they've carved for themselves and play to their strengths and that's exactly what Ball does on Roadside Attractions. All 12 songs are outfitted with Ball's brand of Texas/Louisiana-styled blues and while that may sound static or limiting, there's more than enough room for Ball to breathe, stretch, and keep things interesting without getting lost. Ball wrote or co-wrote all 12 songs and noted producer Gary Nicholson oversaw the Roadside sessions. Colin Linden, another great artist, producer, and songwriter in his own right (he produced Eden Brent's brilliant Ain't Got No Troubles), plays guitar on a majority of these tracks. "That's How It Goes" is another hymn in the gospel of karma, kindness, and brotherhood. Ball's piano boogies and former Double Trouble keys man Reese Wynans' organ provides downhome spiritual flavor while Linden weaves some great slide guitar work underneath. It's a potent opener that leads well into the title track. "Roadside Attractions" is the kind of song that sounds better coming from someone who has spent decades paying dues, playing shows all over the world; in short, it's perfect for Ball. It has a strong hint of Dr. Hook's "The Cover Of 'Rolling Stone'" and yet stands on its own. "Look Before You Leap," co-written by Ball, Nicholson, and Muscle Shoals institution Dan Penn, is a classic blues number with a great horn arrangement. Matt Schermer handles lead guitar and his solo is excellent but this track is really an ensemble piece balancing great singing and playing by Ball and the rest of the musicians. "This Used To Be Paradise" is a weepy ballad of hard times filled with nostalgia for the quiet strength of the blue-collar workers that were once the backbone of her home region in along the Texas-Louisiana border. "Sugar Boogie" is, as you'd expect from the title, a boogie number and it's sprinkled with some harmony vocals straight out of the Andrews Sisters' playbook from the '40s. The album closes with the energetic "The Party's Still Going On," which is a fitting sentiment from a veteran artist with nothing to prove other than she's still got plenty left in the tank. 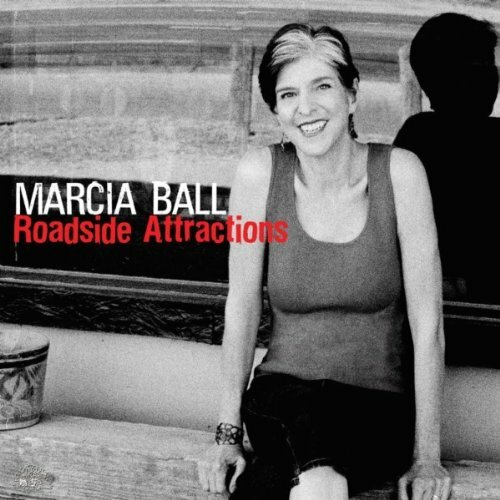 Roadside Attractions is a fine, classy, classic blues record from one of the genre's enduring talents. All 12 songs are outfitted with Ball's brand of Texas/Louisiana-styled blues and while that may sound static or limiting, there's more than enough room for Ball to breathe, stretch, and keep things interesting without getting lost. Ball wrote or co-wrote all 12 songs and noted producer Gary Nicholson oversaw the Roadside sessions. Colin Linden, another great artist, producer, and songwriter in his own right (he produced Eden Brent's brilliant Ain't Got No Troubles), plays guitar on a majority of these tracks. All that talent, experience, and a strong batch of songs make for an enjoyable listen…. "That's How It Goes" is another hymn in the gospel of karma, kindness, and brotherhood. Ball's piano boogies and former Double Trouble keys man Reese Winans' organ provides downhome spiritual flavor while Linden weaves some great slide guitar work underneath. It's a potent opener that leads well into the title track. "Roadside Attractions" is the kind of song that sounds better coming from someone who has spent decades paying dues, playing shows all over the world; in short, it's perfect for Ball. It has a strong hint of Dr. Hook's "The Cover Of 'Rolling Stone'" and yet stands on its own.